Handwriting for kids and adults. Free cursive handwriting and manuscript worksheets and fonts useful for homeschool children’s practice or teaching the D’Nealian alphabet and other handwriting styles. 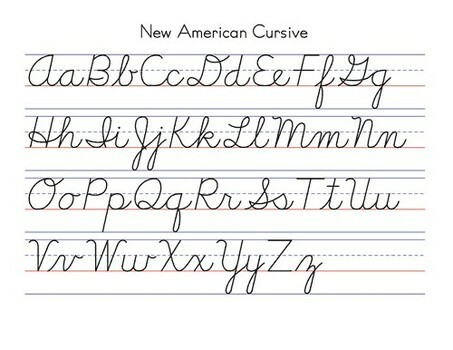 Great resources for improving cursive writing and learning to print neatly for both adults and children in the page below. Handwriting skills are an important developmental task and activity for kids. Through handwriting they are able to express themselves and communicate with the world around them. Improving their penmanship, legibility, pencil grasp, and working on problem areas are all important things that need addressed, whether you are a homeschool parent, teacher, therapist, or just supplementing your child’s classroom activities. A free font to help those who tend to reverse letters of just have a hard time telling letters apart for whatever reason. Though not designed for handwriting, you could print out worksheets in this font to help out a dyslexic child. EFI makes and sells D’Nealian ®-style, Zaner-Bloser ©-style, Handwriting Without Tears (TM)-style, Harcourt Brace ®-style, Peterson Directed Handwriting ©-style, McDougal, Littell ©-style, Getty-Dubay Italic (TM), SSD, and Palmer style handwriting fonts. Commercial site. Windows true type font (.ttf) to download directly from this website. Christopher Jarman cursive handwriting font. The solid line version of Jardotty. Kids Fonts – writing help for homeschoolers. Whether you are homeschooling, or are just tired of the prepackaged worksheets available to early-childhood educators, Kids Fonts is here to help! Handwriting help for homeschoolers. Commercial site: Fontmenu.com Cursive Handwriting typeface offers the possibility to create exercises that follow the guidelines of the D’Nealian ® approach to cursive handwriting. Learning Curve BV contains two versions, one is plain and the other dashed. This font also contains a set of dingbats that helps with practicing elements of cursive writing. Solid and dashed. From Blue Vinyl Fonts, which has lots of nice, free fonts for writing and other uses as well. Mac & Win. Commercial. Block Letters and Cursive Handwriting typefaces enable any computer user to create exercises that follow the guidelines of the D’Nealian ® or the Zaner-Bloser ® approach and letter forming teaching techniques. Designed to give an introduction to writing systems, which hopefully will tantalize the reader into searching for more information on the web or in books and publications. Tip: When creating worksheets for lefties, put the samples across the top, not down the left side. Anything Left-Handed – Are you left handed? Excellent page, with animated illustrations to help a right handed tutor understand how to instruct a young left handed person. These fonts are patterned after the handwriting methods in the workbooks “Cursive Writing Skills,” by Diana Hanbury King. Ms. King has produced both a Right-handed Edition and a Left-handed Edition. Author Annie Thomassen was a homeschool Mom for 9 years. During her daughter’s education she was also completing her undergrad degree, and researching left-handedness. She realized that there was very little out there on teaching a lefty, so she developed a writing method to teach her daughter. This ebook is the result. Tips on how to figure out if a child is left handed and how to teach him how to write. By Clinton Hackney, Ed. D., Language Arts Consultant, Zaner-Bloser. Many students struggle to produce neat, expressive written work, whether or not they have accompanying physical or cognitive difficulties. They may learn much less from an assignment because they must focus on writing mechanics instead of content. Often, dysgraphia is misunderstood. Parents and teachers may think you are lazy or that you don’t care about neatness. This means you have to try even harder to show that you do care. Using Sensory Integration Strategies to Improve Handwriting. Students with difficulties in sensory processing, sensory awareness, and/or perceptual skills usually have handwriting problems. Sells writing paper and graph paper with raised lines so that sensory learners can “feel” their way along as the write. Print out these envelopes and stamps to use to practice addressing and stamping envelopes correctly. Allows you to formulate a worksheet with your child’s name or a short sentence in any of 5 fonts, manuscript or italic. Create your own handwriting worksheets from any words you choose. Kids can practice printing, cursive, or American sign language. There’s even an option to create handwriting worksheets for left-handers. Create your own worksheet with this form from EdHelper. Supports printing, cursive and D’Nealian. Commercial site. Handwriting exercises to music to improve small-muscle skills and eye-hand coordination. Good for aural learners young and old. Learn and practice manuscript handwriting featuring fun coloring page images. These are suitable for preschool, kindergarten and early elementary. A series of graded lined paper .pdf files with a wide variety of uses for free writing practice. Some have space at the top for a picture. Jan has such a charming set of alphabet posters, you’ll want them to decorate your room. They are in traditional, cursive and modern manuscript. Printable worksheets from ABC Teach. These sheets may be printed and reproduced by parents, guardians, and teachers for home or classroom use. Donna Young’s collection. Some pretty basic worksheets for beginning printers. One in Zaner Bloser font. Letter introduction goes along with the book, Teach Your Child to Read in 100 Easy Lessons. On Donna Young’s site.